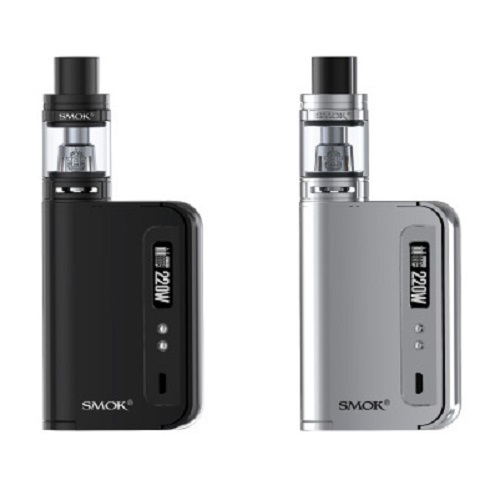 The Smok OSUB king Kit comprises of a stylish, ergonomically efficient device that is packed with some superb features, accompanied by the awesome, Brit Beast Tank. Paired together they make a great team in tandem, certainly destined to make a serious impact with vaper’s worldwide. The device has an 220 Watt max output and is capable of delivering consistent high performance weather in variable wattage mode or temperature control. In temperature mode you have the choice of Titanium, Nickel, Stainless Steel coil options and have the added ability of customising your TCR settings which gives you the flexibility of refining your vape experience with absolute precision. There is also a sub menu to adjust your ramp up which is a welcome bonus for all vaper’s, whatever your vaping style. You can breeze through your day with ease and the bright OLED screen displays all the information you require in a simplistic layout with a puff counter to boot, so you can monitor your vape count at the click of a button. The device also boasts a unique, streamline lateral firing button with two buttons strategically placed on the side to make navigating the user friendly menu and sub menu’s a piece of cake. The Smok OSUB king is a great set-up, that coupled with the Big Baby Beast Tank, looks the part, feels great in the hand and delivers fantastic performance all round. You can be sure to enjoy a rich flavour explosion from the Brit Beast Tank. It has dual bottom airflow, tapered cone design coils, compact shape and easy fill system, topped off with a threaded chunky internal chuff cap that to be frank looks the business! The Big baby Beast Tank enhances flavour taste and cloud production to a whole new level, that you will thoroughly enjoy. Plenty of flavour which, for me, is the most important thing. It also has plenty of vapour - so thick that I couldn't see through it to read my book! Easy to use and it didn't take me too long to figure everything out. And it's good value too.